These corporate supporters – and many like them – share our vision of creating this national Trail, to be treasured for generations to come. We appreciate their investment in making this dream a reality. Providing far-reaching support, CIBC has contributed an impressive $750,000 to date. A portion of this substantial donation is dedicated to extending The Great Trail all the way to Cape Spear in Newfoundland, the easternmost point in North America. With an extraordinary track record of connecting Canadian communities, CIBC is a natural partner for Trans Canada Trail. 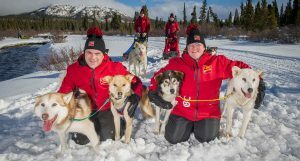 From serving clients in Dawson City during Yukon’s gold rush to selling victory bonds for both world wars, CIBC has played a pivotal role throughout our country’s history. And, there are plenty of reasons to celebrate, since CIBC is celebrating its 150th birthday in 2017, along with Canada. Amid all the festivities for this shared milestone, we want to express our deep appreciation for CIBC’s ongoing support. Heartfelt thanks are in order for Hydro One, a Canadian trailblazer that joined the Chapter 150 Campaign this year. 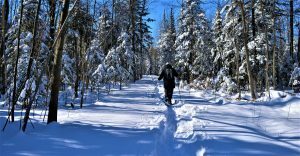 Their $90,000 gift will help bridge an 11.8-kilometre gap between Barrie and Springwater, creating a crucial link between the southern and northern Ontario communities along The Great Trail. Hydro One’s donation to TCT is in keeping with their decades-long legacy of contributing to the health and prosperity of all communities across Ontario. 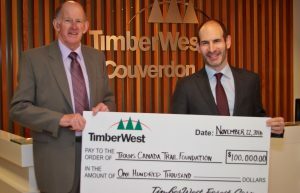 TimberWest is Western Canada’s largest private timber and land management company — and another cherished corporate sponsor that understands the importance of The Great Trail in promoting active lifestyles within a natural environment. Their $100,000 donation will fund the spectacular Sooke Hills Wilderness Regional Trail, which spans 21 kilometres in British Columbian wilderness. This scenic addition will link two outstanding sections of the Trail — the Cowichan Valley and Nanaimo Regional Trails in the north with the Galloping Goose Regional Trail in the south. TimberWest’s generous gift reflects their philosophy of responsible stewardship and their commitment to the economic and social well-being of the communities in which they operate. Thank you, TimberWest, for bringing British Columbia’s section of The Great Trail one step closer to province-wide connection.